May 10, 2011 at Station 40, 3030b 16th St.
Corrina: There’s lot’s of y’all here tonight. It’s good to see you. [Speaks in Ohlone] I said good day, my name’s Corrina and I’m Leshyanka, or Chochenyo. I’m Ohlone. That was the first language that was spoken in the East Bay, and my great grandfather Jose Guzman was one of the last speakers of that language. I’m happy to be here tonight. How many of you have gone to Glen Cove or Sogorea Te? [many hands raised] Oh, yeah, thank you. I’m going to give you a little bit of history about shellmounds. Shellmounds are the burial sites of our ancestors. They are not just village sites, but they are always burial sites. There are some villages that didn’t have burials, but all the shellmounds are burial sites. They were places where we laid our ancestors to rest. We actually buried them in the soil and then covered them with shell and then more soil. And as the years and centuries went by, these mounds became huger and huger. They became monuments to the people that lived here in the Bay Area. In 1909 this man named Nels Nelson worked at UC Berkeley in the archaeology department. He realized that the Bay Area had all these monuments there, but there was so much development happening in 1909 that he wanted to be able to put it in place where these burials, these shellmounds were. And at that time in 1909, he found 425 shellmounds that ringed the Bay Area, places that were monuments to the Ohlone people and the Bay Miwok people. Sogorea Te was Solano County 236; it was on that map in 1909. We’ve been doing shellmound work for probably the last twelve years, and because of the work that we were doing, we began to work with Wounded Knee [De Ocampo], who is working on this site. Perry [Matlock], who is a resident here in San Francisco, and really supportive, worked on sites even before I got involved in doing this work around sacred sites. He helped preserve a site in San Bruno, San Bruno Mountain. There is a shellmound there that will be protected forever because of the work that they did, to bring light to that area. In 1999 we started an organization in Oakland called Indian People Organizing for Change. 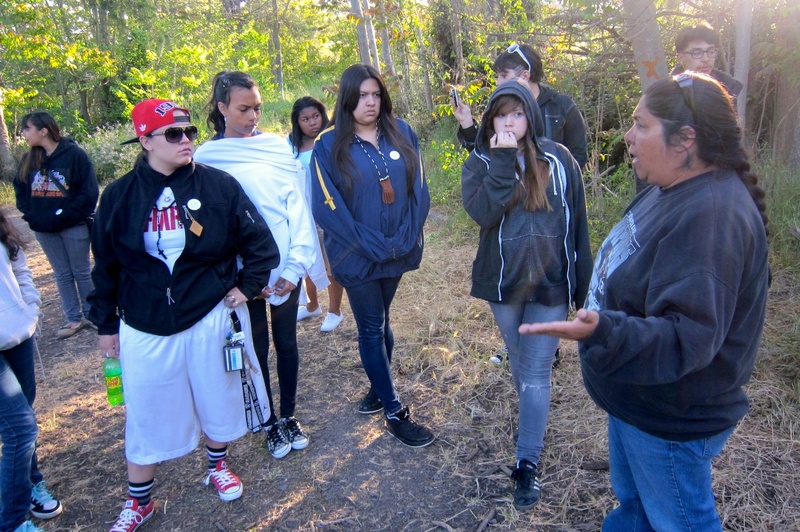 We started it because they were closing the bases in Alameda and Oakland and there were a group of native people who came together to find out if native people were interested in having a training center at the Oakland Army Base. So we began to do basic community organizing stuff, we went door to door, knocking on people’s doors, asking them what they were interested in. We found out that wasn’t so much what people were interested in, a training center out there, but in having a voice in their community. So we set up meetings so they can talk to city council and can do different kinds of actions and stuff like that. In the midst of doing all that, I got my first phone call in Alameda. I was living as an on-site case manager for a domestic violence program on the Alameda base. And I got a phone call from the housing authority in Alameda saying we found one of your ancestors, can you come and tell us what we should do? The housing authority, because there was a leak underneath the house, they accidentally found her kneecap. She was over 3800 years old, my 3800 year old grandma that was there. They had to remove her to get the pipe fixed. There are shellmounds all over Alameda, there are shell mounds all over Oakland and the greater Bay Area. We got a phone call about thirteen bodies being removed in San Jose because they wanted to put a swimming pool at a new condominium complex they were building. We went there to pray; we went there and demonstrated. We went there at night because they wouldn’t let us in to put our prayers down properly and we got chased by the police. That’s the way we had to deal with stuff like that. Then we found out about the Emeryville one. Emeryville broke my heart. The city of Emeryville knew about that project being on sacred ground, on one of the oldest places around. Not as old as the one in Berkeley, but really old. It was on an 1852 coast survey map, so people coming into the Bay Area way back then could see this and use it as a point of reference that they were coming into the Bay Area. It was that huge, it was 60 feet high and 350 feet in diameter. It was a huge place. And always our shellmounds run along the side of freshwater creeks, where it goes right into the bay and meets the salt water. We ate lots of shellfish; we ate lots of other things, but we ate lots of shellfish. So we used the shells to cover our ancestors in that kind of a way, in a special kind and manner. A long time ago the Emeryville mound was desecrated and there was a lot of stuff that was brought in on top of it before the EPA laws were brought in. During the dot com era, everybody remembers that, when the internet became all famous, and people were dying to buy anything, were outbidding each other for houses that didn’t cost that much a long time ago. And the Bay Area was booming with money, and Emeryville was having a hard time. And they got some money from the United States government to clean up the brownfields there. But what they found was a huge burial site. And it was toxic; many of our ancestors’ bones were messed up with the crude stuff that they had put in the land – arsenic and different horrible things – into the ground. And so thousands of our ancestors – we don’t even know how many – were put into waste dumps. 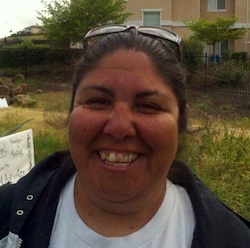 The ones that were kept were put into an unmarked grave that even Ohlone people don’t know where they are on that mall. So on the day after Thanksgiving, the biggest shopping day of the year, we go down there every year and we protest, we do an educational protest, so that something like this never happens again. 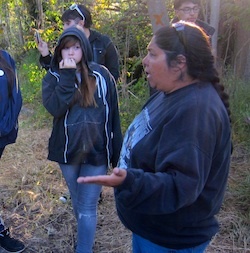 We did the shellmound walks, because we realized that people didn’t understand what shellmounds were, and that people didn’t realize who Ohlone people were, and that there were still Ohlone people that existed in the Bay Area. So we created these walks. We took Nels Nelson’s map, we figured out the route, and we walked. The first year we walked 280 miles. We walked from Sogorea Te down to San Jose, up the other side. It took us three weeks. And we were supported by people from Japan, from Australia, from the Cape Verde Islands, from Nova Scotia, and people all over this country. They came and they walked with us and we prayed. We did that for four years. We did different routes. This last weekend – we had five students working with us from UC Berkeley – and they did a route for Oakland. We started at Union Point Park, walked to Jack London square, walked around the east side of the lake and up to 55th and Telegraph. And we stopped at seven different sites. Every one of those sites is covered with a building, with a parking lot, with streets. None of it was uncovered. All those shellmounds that once existed were gone. We’ve been working on Sogorea Te for twelve years. Wounded started out working on that stuff. We went to city council meetings. We asked them to please not desecrate this site, to please leave the site as it is, to not move anything more than they had already destroyed it. Basically got sent away. The Greater Vallejo Recreation District, GVRD, that Wounded was talking about, we went to their meetings. They don’t say that there’s not a shell mound there, but they say that they are not going to disturb it in any way. In 1984 they took land, they built up these condominiums and they took land from one area up above where the 15 acres is and they moved it down to where Sogorea Te is. When they did that they found twelve burials and six cremations and funerary objects. They took those and they put them at UC Berkeley. But then they just moved the rest of the land. And so they’re saying that none of that land has anything else in it. Now, for me, anything that’s more than 3500 years old, that’s a little strange, that they would find twelve burials and a couple of cremations and nothing else would be there. So they want to grade this hill that they created with the land that they moved, want to grade it down seven or eight feet so folks can have a better view of the water. And we’re saying no, that’s not going to happen. We’re not going to let that happen. They want to put a bathroom on top of a place that we know there was burials before and that we know there are probably individuals still under there. They want to put a parking lot, they want a paved bike trail. We know, because we’ve been on the land, that there is ample street parking. We’ve had three hundred people there and never needed for parking. And so we know that’s not needed. It’s crazy. We fought them. We went to them, we talked to them, we pleaded with them, and when they were going through the draft EIR process we said, please, don’t desecrate our ancestors. Please don’t allow this to happen. And in their final EIR report, what they said was it doesn’t have anything to do with the EIR, no comment required. Move on. So they dismissed us. One week before we came into the site we went and met with them one more time, and we asked them again don’t grade the hill, don’t put a bathroom, don’t put a parking lot. And they dismissed us again. They treated us like we had tails for about ten years. And then, on the 14th of April when we found out that their permits were going to go through, when the city of Vallejo, who is broke, waived $85 thousand worth of permits for them to do this desecration, we went and we took the site. We set up an altar and we’ve been praying there ever since. And we’ve asked folks to come and help us to do that. It was interesting because they didn’t know what to do. And they still don’t know what to do with us, which is a good thing right now. But I think our ancestors are really taking care of us in that kind of a way. We have people that have come from all walks of life to help support us. The interesting thing is that GVRD has always told us that Glen Cove park, the waterfront park, was something they were doing because they promised it to the residents that lived there. We have had so much support from the Glen Cove residents. They have brought us firewood and tarps and water and food and ice. They come down and they spoke for us at their own meetings in support of what we’re doing there. And not knowing, not being told by GVRD and the city of Vallejo, that this is a burial site. They don’t want it to be disturbed. People come there and they fish. We had a guy who came a couple of weeks ago and he caught a sturgeon as tall as me. People come there and fish and we don’t disturb them. People come through all the time on their bikes, they walk their dogs, they bring their families. That doesn’t disturb us. What we want them to do is leave it alone and leave us to have our ceremonies when we need to have our ceremonies and allow us to have that place to pray. When I was talking about those shellmounds we visited last weekend, that we’ve been praying at all these years, we’re standing on asphalt, we’re standing on cement when we’re saying our prayers. At Sogorea Te we can stand on the land, we can say our prayers, we can send them up in that kind of way, the way that we were supposed to all along, the way that we were meant to, the way that we were taught according to our original teachings. We all of us have original teachings, it doesn’t matter where your background is. This is how we were taught and this is how we choose to do this. We have the right to do this as American Indian people; this is our right. And so when we went to meet with them, it wasn’t about meeting with them about not putting the parking lot or the bathrooms on. What they wanted to meet with us was about this vigil we were having. They were being nice to us by allowing us to be there. They were being nice to us by not having us have permits. And we were saying, no, we have the god-given right. We also have the American Indian Religious Freedom Act of 1978. We also have the UN Declaration on indigenous people’s rights that allows us to pray the way we want to, to choose our sacred sites, and to pass on that information to the next generation. It’s our right to do that. And so we set up this sacred fire. That fire has been burning since the 14th of April, and it has not gone out. We have people in different parts of this country who have set up sacred fires to burn as long as ours does, in support of us. We have people in different parts of the world to do the same thing. We have all these people that are doing this. And what GVRD says is that one Indian says it’s ok to do this. And so they want to desecrate the site. They say they went through the law process and the process is ok with them. We’re saying, no, it’s not good enough. We’re standing up for our ancestors. We’re not going to allow them to continue to do this. We’re not going to allow them to continue to unbury our ancestors and put them wherever they feel like it, in lockers, in storage places. That’s not how it’s gonna be anymore. There’s a generation of people who know where we’re supposed to be and how we’re supposed to stand and how we’re supposed to act. And it might have been ok before but it’s not ok now. What happens, no matter who you are…when we have burials, when somebody in your family passes away, we have ceremonies to put them back down. It doesn’t matter what religion you are or what culture you come from; we all have that. We go through those processes in order to grieve. None of us have a process to bring them back up. Nobody has that; nobody has those ceremonies. And we shouldn’t have to continue to do that and have our people being desecrated like that. We shouldn’t have to stand beside them and cry while this is going on. We shouldn’t have to tell our children that we are sorry that this is going on. We have to make a stand. The interesting thing is that today I got an e-mail, and the e-mail said there’s a serpent mound [Haudenosaunee burial mound in Ontario] that’s about to be desecrated by bulldozers, and those people decided to take a stand too. They’re going to do a sit-in and they’re asking other folks to help them out. So this is something that is not just here in the Bay Area, but it’s going on all over the country. Sacred sites of indigenous people have been desecrated since other folks got here. And now it’s time to stop. We’re not asking just Indian people to come and help us stop this, but every individual. Nobody should have to go through this desecration. One cool thing is that finally the Mayor [of Vallejo] came down. Wounded’s known him for 60 years, they went to school together, they grew up together. He didn’t want to come down there; political stuff gets involved. Finally he came down there, not saying anything. He just came and listened. One of the things that I told him is that the city of Vallejo has the opportunity to do something that no other city in the Bay Area has done. They can stand up and say we are going to protect this sacred site. We are not going to allow it to be bulldozed over, we are going to allow it for the next seven generations, we are going to allow it forever to remain here, and we’re going to allow this to happen in the city of Vallejo. And that would be a win-win situation. But they stopped talking to us. They decided that they don’t want to talk, they don’t know how to talk to us. They don’t know what those federal laws are. Which is a good thing for us, because they don’t know what to do so we’re at a standstill right now. And so now we have an opportunity to come out and talk to folks like you and ask you guys to spread the word that this thing is going on right here in our own back yard. Every single day there’s burials that are being disturbed in Pleasanton [to build a Safeway], there’s burials that are being disturbed in San Ramon, there are burials that have been disturbed for years in San Francisco. All over the Bay Area these shellmounds existed. Today, where do we have to take people? I love the way Perry says it; when you go to other countries, you can go to Stonehenge and you can touch that, that ancient monument that was there. You can go to the pyramids in Egypt and South America and you can touch those places. You can feel that culture that was there. When you have family and relatives that come to the Bay Area, what monuments do you have to take them to? Where can you take them and show them the places that people lived before? Can you take them to Emeryville and show them the fake little mound that is there that has nothing to do with our culture? It doesn’t even say that there were thousands of people buried there. It doesn’t tell us anything. When we go to school and we’re in third grade, we learn about the mission system. Most adults don’t even remember what they learned about it. My ancestors were directly enslaved at Mission Dolores and Mission San Jose. I know where I came from and that we still exist. I have children, so I know that we’re going to continue to exist. But people in the Bay Area don’t know that. We come from such a huge melting pot; people come from all over the world. But they don’t understand that we are still here. We’re not just a street sign; we’re not just that name of a place. We’re not just Ohlone Way and Shellmound Street, you know. We are more than that. We have culture and language and stuff that we’re supposed to do. And with your help we can continue to do that. I ask you guys to come out. Support us. Support us in this site and support us continuously to go on and on. This isn’t just happening here; it’s happening all over the place. It’s our responsibility, not just as the Indian community but as people in general to stand up for these sacred sites, to allow people to rest in peace. Forever. That’s what we do as a people, no matter who we are, when we lay our relatives down, it’s forever. It’s not just for a couple of decades. So I want to thank you guys for coming out and listening to me, and I probably forgot a gazillion things. But before you have questions, I think Michelle, who’s been one of our people who’s been working on the site with us, wants to talk a little bit about something.